Sometimes, the quest for Reed means discovering exactly where he wasn't on a given day. In April of 1975, the World Centre for Shakespeare Studies, headed by Sam Wanamaker, presented the fourth annual Shakespeare Birthday Celebrations. Events that year included a two-month exhibition of "Shakespeare Round the Globe" at the Bear Gardens Museum (now Shakespeare's Globe), a gala concert of the Royal Philharmonic Orchestrafeaturing the Huddersfield Choral Society (conducted by John Pritchard), Ermano Mauro, Richard Briers, Judi Dench, Richard Johnson, Barbara Leigh-Hunt, Spike Milligan, Leo McKern, Richard Pasco, and John Strideperforming at Royal Festival Hall, and a concert of "Shakespeare jazz" at Southwark Cathedral (directed by Neil Ardley and coordinated by Ian Carr), with performances by Roy Babbington, Pete and Pepi Lemer, Henry Lowther, John Marshall, Dave Macrae, Paul Ruthorford, Alan Skidmore, Chris Spedding, Trevor Tomkins, Ray Warleigh, and others. 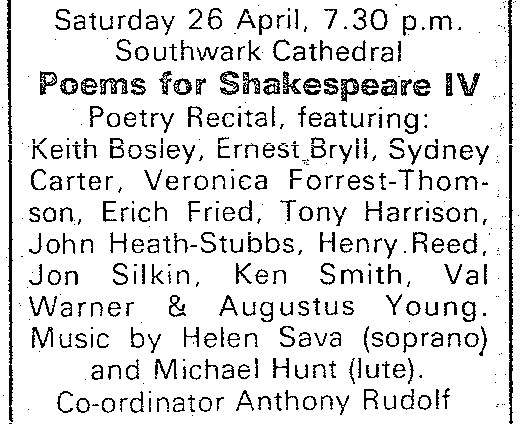 Concluding the festival was a poetry recital on the evening of April 26: "Poems for Shakespeare IV," also staged at Southwark Cathedral. Scheduled to read were Keith Bosley, Ernest Bryll, Sydney Carter, Veronica Forrest-Thomson, Erich Fried, Tony Harrison, John Heath-Stubbs, Jon Silkin, Ken Smith, Val Warner, Augustus Young, and Henry Reed, delivering poems commissioned specially for the event. Musical accompaniment was provided by Helen Sava and Michael Hunt. Advertisement from The Spectator, April 26, 1975. This is the fourth collection of poems based, however intimately or remotely, on the experience of reading Shakespeare's plays; they were originally read as part of the Shakespeare birthday celebrations at Southwark Cathedral last year. Ten poets are each represented by a single poem, ranging from a vigorous, straightforward and pleasantly ironical ballad by Sidney Carter [sic] to a strange elliptical and disturbing meditation by the late Veronica Forrest-Thomson. My own favourites are 'Winter in Illyria' by John Heath-Stubbs and 'Winter Occasions' by Ken Smith. Anthony Rudolf's introduction is oddly aggressive except where it pays deserved tribute to Miss Forrest-Thomson. Her paradis artificiels were cut short two years later. At 'Poems for Shakespeare' in Southwark Cathedral I stood at the back, breathing the air coming up off the river. On the Tube home, Eddie Linden told Tony and myself that he saw Veronica in one of the cloisters, but she had disappeared before her turn came to deconstruct Shakespeare. That was the night of her suicide. She lives on, on the tip of the tongue of the L-a-n-g-u-a-g-e poets. I sent Augustus Young an e-mail to see if he could tell me anything of Reed reading at "Poems for Shakespeare" in 1975. Mr. Young thoughtfully forwarded me to Anthony Rudolf, who had directed the event that year. Mr. Rudolf's gracious reply told me what I had already feared: Henry Reed did not appear; he was in hospital with one of his chronic illnesses, and could not be finally persuaded.